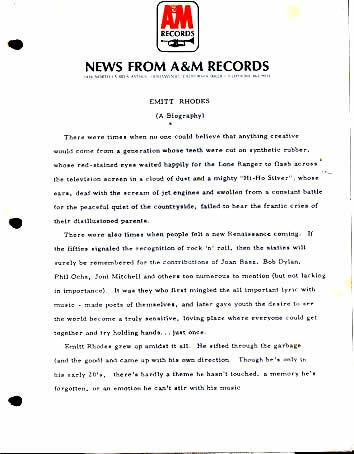 This is a copy of the official A&M Emitt Rhodes biography sent out by the press office. No details on who it was written by. Probably not Emitt, but you never know. The scan is a bit hard to read so I've transcribed it below. If you've got The American Dream, you've probably already read it; it's the text on the back of the album. There were times when no one could believe that anything creative would come from a generation whose teeth were cut on synthetic rubber, whose red-strained eyes waited happily for the Lone Ranger to flash across the television screen in a cloud of dust and a mighty "Hi-Ho Silver"; whose ears, deaf with the scream of jet engines and swollen from a constant battle for the peaceful quiet of the countryside, failed to hear the frantic cries of disillusioned parents. There were also times when people felt a new Renaissance coming. If the fifties signaled the recognition of rock 'n' roll, then the sixties will surely be remembered for the contributions of Joan Baez, Bob Dylan, Phil Ochs, Joni Mitchell [No Beatles? Hmmm... - Kevin]and others too numerous to mention (but not lacking in importance.) It was they who first mingled the all important lyric with music  made poets of themselves, and later gave youth the desire to see the world become a truly sensitive, loving place where everyone could get together and try holding hands... just once. Emitt Rhodes grew up amidst it all. He sifted through the garbage (and the good) and came up with his own direction. Though he's only a spritely twenty, there's hardly a theme he hasn't touched, a memory he's forgotten, or an emotion he can't stir with his music. 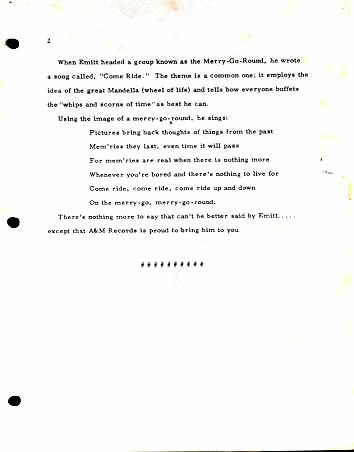 There's nothing more to say that can't be better said by Emitt... except that A&M Records is proud to bring him to you.